Mount Alamo - The City That Never Was. Mount Alamo was designed to be a model city and a grand resort high in the Guadalupe Mountains. When completed it would rival the resorts of the Adirondacks of New York and the Rockies of Colorado. Promoters called Mount Alamo the Saratoga of Texas - after Saratoga Springs. As soon as engineers plotted the route for a railroad through the Hill Country, dreamers and schemers began laying plans to build resort towns in the scenic hills along the way. 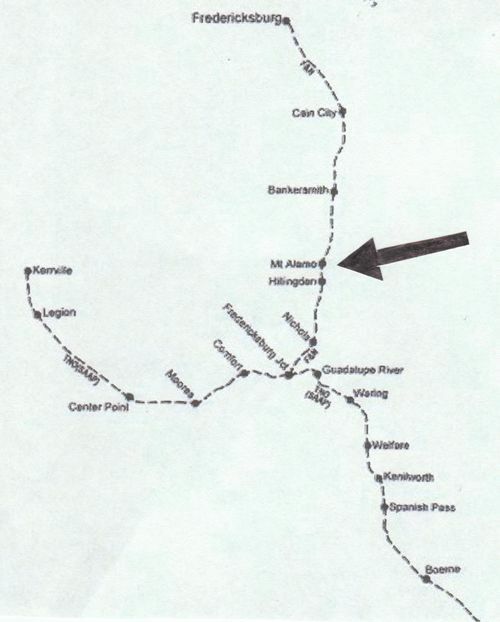 In 1913, as preliminary work began on the railroad between Waring and Fredericksburg, a group of businessmen, many from San Antonio, focused on a spectacular piece of real estate, 56 miles north of the Alamo city, adjacent to the "big hill," near the Gillespie and Kendall County line. Investors formed the Mountain Townsite Company and began raising money to make their dream come true. Because they hoped to sell summer homes to prosperous San Antonio families, they called their resort Mount Alamo. Courtesy Texas Transportation Museum, Hugh Hemphill, Director. 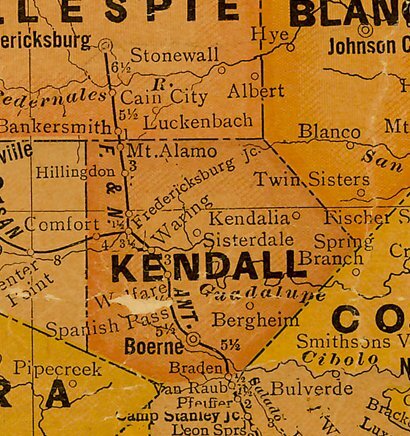 The plan to build the resort began with colorful stories planted in major Texas newspapers. The stories accurately described the 1,500 acre site as one of the most beautiful places on earth. It was a mountain paradise with a commanding view of the Hill Country. It was 2,300 feet above sea level, reported to be the highest point in the Guadalupe range, and 600 feet above the valley floor. The site was 500 feet higher than Lookout Mountain near Chattanooga and as picturesque as the Cumberlands in Tennessee. The beauty of Mount Alamo was obvious to anyone who saw it, but other claims were a little hard to swallow. Mount Alamo, promoters alleged, had a naturally delightful climate. The air stayed cool all summer long. Bacteria could not live in the altitude of Mount Alamo. Even insects could not survive in the cool mountain air. An article in The San Antonio Light described Mount Alamo as a fantasy land from Greek mythology. "Garbed in rustic beauty, it is an enchanted spot. On its summit is a fountain of pure water, coming as if directed by the will of the Creator. It forms a natural reservoir that is not unlike the fabled Parnassus where Apollo located after searching the world for a place of perpetual youth and where he and the 9 muses dwelt eternal." Officials of the Mountain Townsite Company, hoping to attract investors, organized automobile trips to from San Antonio to Mount Alamo. After the railroad to Fredericksburg was completed, special excursions brought in potential homebuyers by the trainload. As investors came on board, and lots began to sell, specific plans for Mount Alamo took shape. The nucleus of the resort was to be an 18-hole golf course covering 100 acres. At the center of the golf course would be a luxurious 80-room clubhouse for renters and weekenders- each room with a private bath and a screened in sleeping porch. Developers promised a town with "all the modern conveniences." There would be a waterworks system, a sewage system and an electric plant. These modern systems would be constructed while carefully preserving the natural charm of the countryside. Everything about Mount Alamo would be built to a grand scale. The narrowest streets would be at least 80 feet wide. Some streets would be 150 feet wide. The main street, Berlin Boulevard, would be 200 feet wide with a 100 feet parkway in the middle. But as in any ambitious project, dreaming is easy. Making dreams come true is hard, dirty work and requires a different set of skills. For Mount Alamo to succeed, the dreamers had to step aside and the doers had to take control. But that never happened. Some streets were laid out and a little dirt moved. Other than that, Mount Alamo never got off the ground. As columnist Charley Eckhardt wrote in 1994, "Nothing, today, is left of Mount Alamo except the bare rocks of the hilltop and the cedar and live oaks that grow there." "Dexter Writing History of Texas' Banks Growth," Galveston Daily News, October 30, 1913. "'Beauty Spots,' make Gillespie County Famous," The San Antonio Light, November 16, 1913. "Pleasure Resort Will Be Built in Scenic Guadalupe Mountains," The San Antonio Light, August 31, 1913. "With Some Doing, Fredericksburg Had Railroad in 1913," The Seguin Gazette-Enterprise, January 6, 1994.